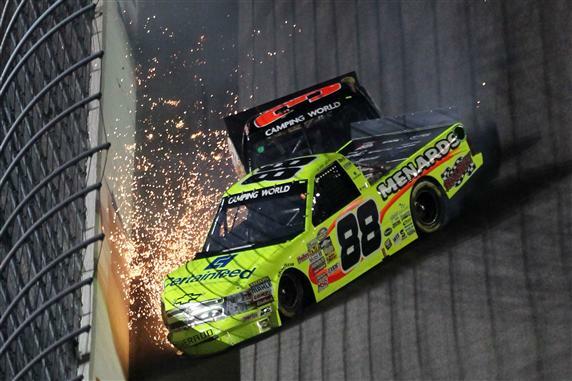 FORT WORTH, Texas—Ron Hornaday Jr. won the Camping World Truck Series WinStar World Casino 400k Friday night when race leader Johnny Sauter was black-flagged for changing lanes on the night’s final restart. Sauter, who had passed Hornaday for the lead with a powerful run through Turn 4 on Lap 130, was penalized for moving from the outside lane to in front of Hornaday before crossing the start/finish line on a green-white-checkered restart on Lap 167. The race went 168 laps, one beyond its scheduled distance. The black flag call was made by series director Wayne Auton, who Hornaday said specifically addressed the issue during Friday’s driver’s meeting. Sauter, the series points leader, was scored 22nd, the last vehicle on the lead lap. Hornaday, a four-time series champion, earned his 48th career victory and first of the season. 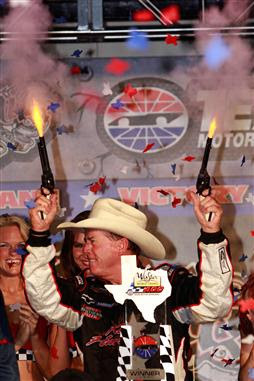 It was his third victory on Texas’ 1.5-mile quadoval. Parker Kligerman finished second for his third top 10 of the season. He is the second-highest rookie, eighth in the standings. David Mayhew’s third-place run easily eclipsed his previous best series finish of 14th. Brian Ickler and rookie Joey Coulter rounded out the top five. Contact between Austin Dillon and Matt Crafton—fourth and fifth in the point standings, respectively—ended Crafton’s night after a grinding crash into the outside and infield retaining walls on Lap 90. The two were entering the quadoval off Turn 4 when Dillon hooked the right rear quarter panel of Crafton’s truck and sent it spinning. Crafton exited uninjured, but rather than head for the ambulance, he proceeded to walk toward Turn 4 to “confront” Dillon as he cycled around. Crafton raised his arms in a “What were you thinking?” pose as Dillon drove past. After reviewing the replay, Crafton was considerably cooler. Earlier, Todd Bodine saw his shot at a seventh victory at Texas end via contact and a crash with David Starr. Their crash on Lap 68 in Turn 2 was the second of the night involving Bodine, who was caught up in another Turn 2 incident with Ickler on Lap 52. Bodine won this event in 2009 and 2010.